Former Philadelphia Flyers left wing Simon Gagne announced his retirement as a player on Tuesday after a 14-year National Hockey League career where he recorded 601 points in 882 NHL games, including 11 seasons with the Flyers. Gagne, 35 (2/29/80), scored 264 goals and 271 assists for 535 points and 284 penalty minutes in 691 career regular season games over parts of 11 seasons with the Flyers. He ranks ninth on the Flyers’ all-time list in goals (264) and 10th in points (535) and games played (691), while placing fourth in both goals and points among left wings in Flyers history. In 90 career Stanley Cup Playoff games with the Flyers, he recorded 32 goals and 15 assists for 47 points, ranking eighth all-time in Flyers playoff history in goals (32) and tied for seventh in game-winning goals (6). Over the course of his 11 seasons in Philadelphia, Gagne led the team in goals on three occasions (2001-02, 2005-06 & 2006-07) and twice in points (2005-06 & 2006-07). He has also been recipient of the Bobby Clarke Trophy, as the team MVP, on two occasions (2005-06 & 2006-07), while also being named to the mid-season NHL All-Star game twice (2000-01 & 2006-07). After spending the first 10 seasons of his NHL career with the Flyers, Gagne was traded to the Tampa Bay Lightning on June 19, 2010 in exchange for defenseman Matt Walker and a fourth-round pick in the 2011 NHL Entry Draft. He spent one season with the Lightning (2010-11) and parts of two seasons with the Los Angeles Kings (2011-12 & 2012-13) where he helped the team win the Stanley Cup in 2012. He returned to the Flyers in a trade with the Kings on Feb. 26, 2013 in exchange for a conditional fourth-round pick in the 2013 NHL Entry Draft. A native of Ste. 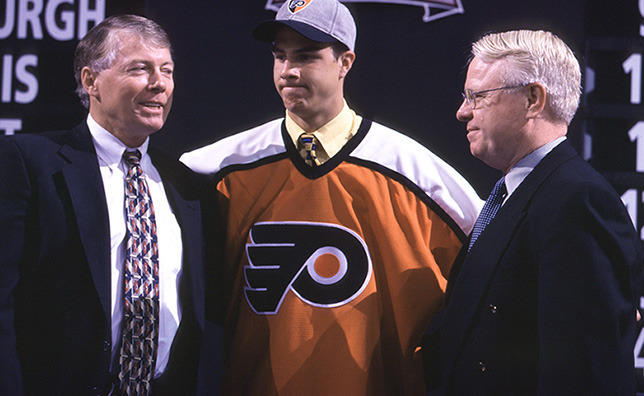 Foy, Quebec, Gagne was selected by the Flyers in the first round (22nd overall) of the 1998 NHL Entry Draft.